I made this DIY birch log candle holder from found wood. I was stacking wood to make a cozy fire in the fire pit last month when I came across this perfect spilt log. At least I thought it was perfect. Even better was that it was birch, perfectly covered with the silvery white bark that I love. 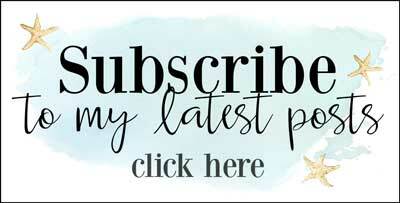 You guys know my weakness for birch DIY projects! Knowing I could do something fun with my new found treasure, I tossed it off to the side for later. Fast forward a month…needing a little more rustic filler decor for the North House. I remembered my birch log out in the shed and instantly knew what I’d make, a log candleholder where we could change out the candles depending on the season. Red for holidays and winter, white for other seasons. I’d even use a burnt orange or other color for the fall. It’s easy to make a log candle holder from a piece of firewood. 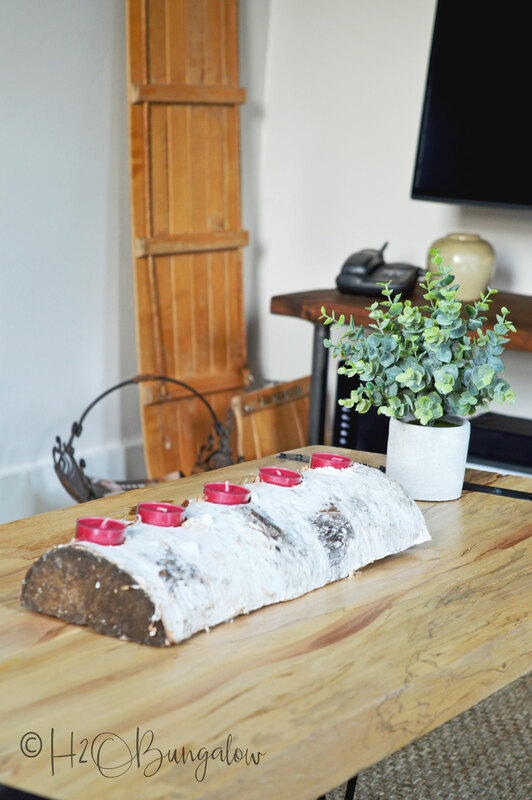 Here’s a few tips that will help your DIY log candle holder turn out just as good or better than one you’d buy in a store. Step #1- Choose your wood log. Pick a piece of wood that has a flat bottom. Pick a log that’s been split in half or an interesting shaped log. Lay the log on a flat surface and trim or sand any areas that you want so it sits flat in the way you want it to sit. Step #3 – Cut the holes for the candles. I used a 1″ forestner bit to cut the holes to hold my tea light candles. You could use a 1″ spade bit as well. I like this kit for a good price on a spade bit. But, I think the forestner bits cut neater. Either way, mark where you want your candles to sit and drill small pilot holes. That way your bit won’t wander and you’ll get clean cuts. Hold the drill with your drill bit square over the split log when you are drilling to get even and flat cuts into the wood. Choose the drill bit that best fits your candle. You can also add a little putty around your candle to help hold it in place in the log if your holes are a tad large. I also like to use the impact setting on my drill as it cuts the holes a lot faster. You could easily make a branch candle holder following the same directions. I think a long branch candle holder would be fabulously dramatic running down a long dining table, don’t you? 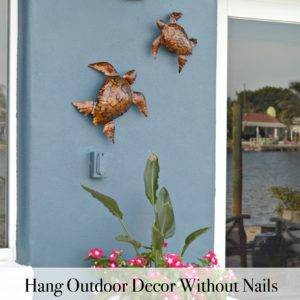 Another awesome idea would be to make a driftwood candle holder for the beach dweller. I’d love one of those for our place in FL! Don’t forget to pick your favorite picture and pin it for later or share it on Facebook with your friends! I love simple rustic decor. 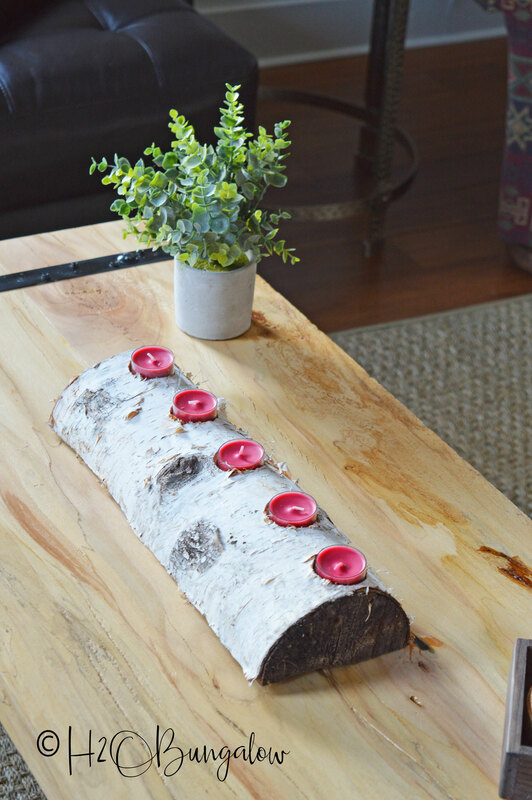 This rustic DIY log candle holder is easy to make and easy on the budget. Another win-win for the North House decor! 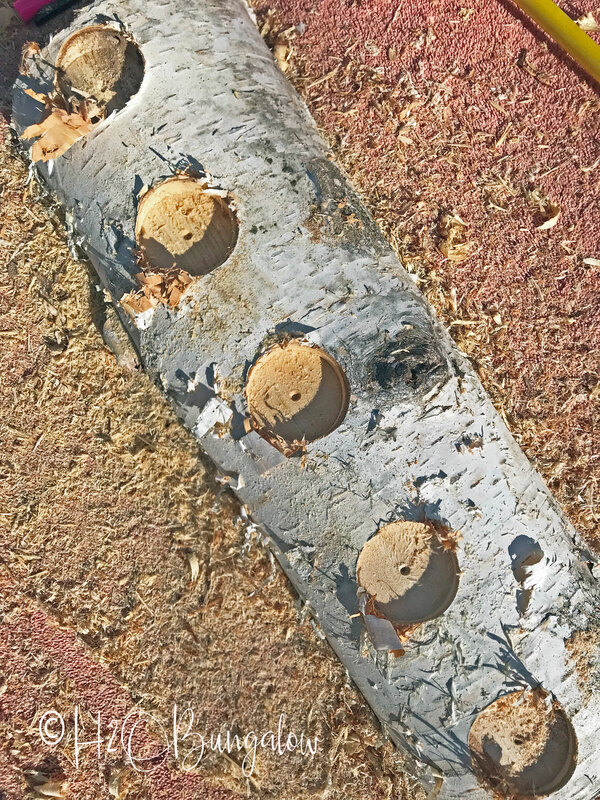 Love birch bark DIY project ideas? You may also love this DIY Birch Bark Candle Holder or maybe my DIY Birch Bark Picture Frame project too. For fall, try making these DIY Birch Bark Pumpkins. 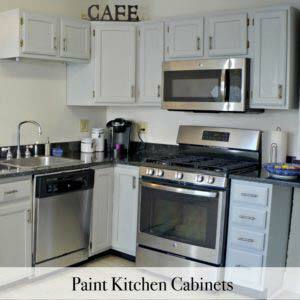 Do you have a favorite wood that you love for DIY projects or to decorate with? 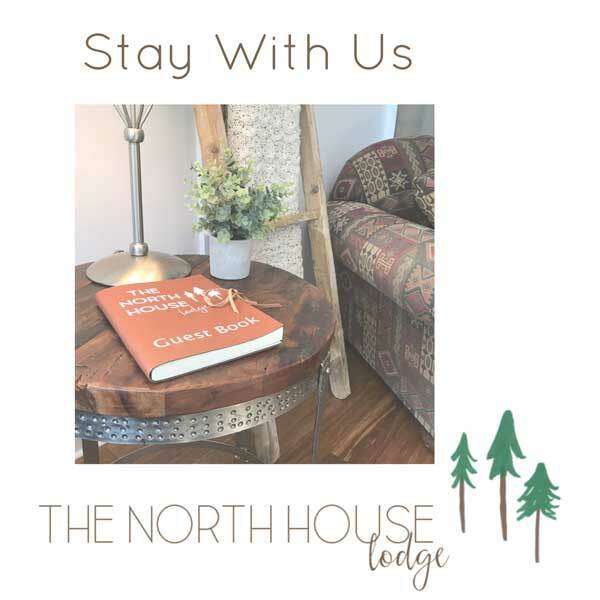 If you haven’t checked it out, go and tour The North House Lodge #52 and see more of the projects throughout the photos. 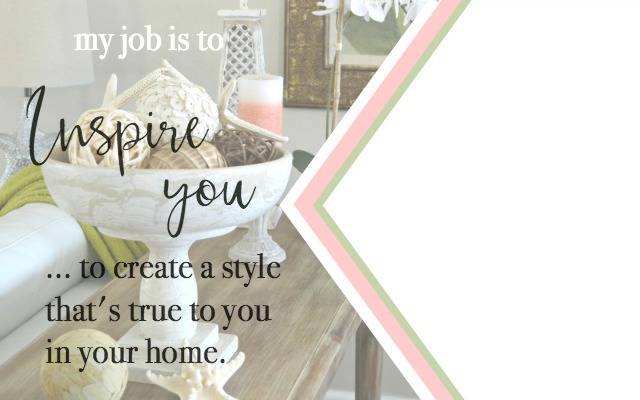 This is gorgeous and so easy! Gotta love it! Thank you for sharing on Merry Monday! We hope you will join us again next week! I love how this turned out! The birch log is perfect! 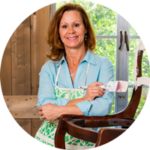 Hi Dede and thank you! I’m a pushover for birch projects of any kind. I love how it looks on the table …so perfect for the New England fall and winter 🙂 Thanks so much for your visit my friend! This looks great on your North House table. I’ve got a birch log that a friend brought back from a trip to Michigan and gave to me that I want to make something similar with. I am planning to use small LED tea lights in mine. Hi Paula… LED lights are smart. I should do that too since this birch log is in the North House. 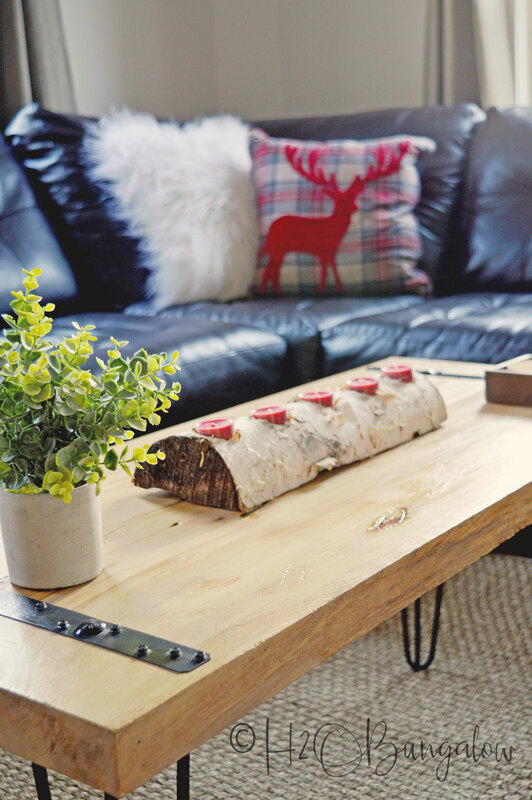 This is such an easy project to make and looks so sweet on a coffee table! I have tried repeatery to see your 18 table ideas and can only get this one. Hi Grace, So sorry there must be a link mix up. Here is a link to the table decor post with the 18 table ideas https://h2obungalow.com/coastal-holiday-tablescape-and-18-more-great-table-ideas/ It may be a bit late as I’m just getting back from the holiday and catching up. 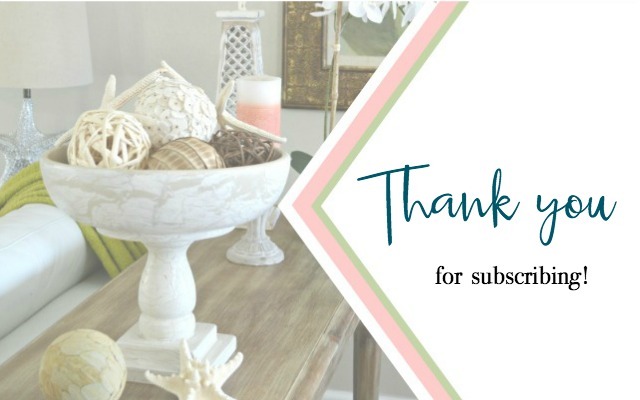 Thanks so much for your visit and I hope you can still find the tablescape ideas useful!